Property Size 1,251 sq. ft. 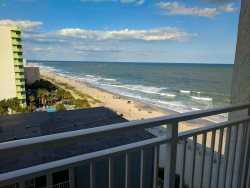 Located within the North Tower of the 24 hour gated 57 acre Ocean Creek Resort this 3 bedroom/3 bath oceanfront condo offers amazing scenic oceanfront views across a natural inlet creek. Enjoy the views from the spacious balcony or the oceanfront master bedroom suite. Well maintained and fully furnished. Recent upgrades have been done to include stainless steel appliances, interior painted and smooth ceilings. Ocean Creek Resort offers guests oceanfront pools, a beach club, volleyball, kids playground, exercise room, tennis center, putting green, restaurants and more in a park like setting. All this and conveniently located across from all the shops and restaurants at Barefoot Landing. PLEASE NOTE: Must be 25 years of age to book. Please note: The key and parking pass to this unit must be picked up at our office location, which is approximately 15-20 mins (can vary with traffic). At your departure, you can leave the key in the unit for our cleaner to pick up. We recommend guests sending a picture of the key at their departure to avoid any charges. Ocean Creek Resort offers guests oceanfront pools, a beach club, volleyball, kids playground, exercise room, tennis center, putting green, restaurants and more in a park like setting. All this and conveniently located across from all the shops and restaurants at Barefoot Landing. Please Note Must be 25 & up to rent. Motorcycles and Trailers are allowed but they can NOT park on the main property of Ocean Creek. They may be parked in the designated area; provided immediately outside the security gate at the front entrance to the property.